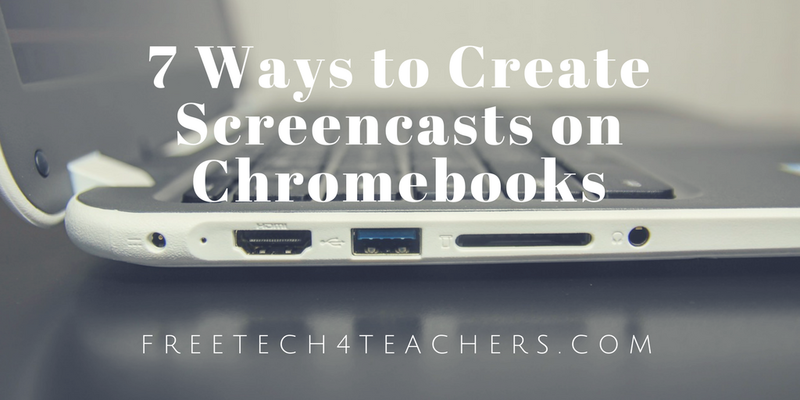 This week's news about Screencast-o-matic has prompted me to update my list of tools for creating screencast videos on Chromebooks. All of these tools can be used by you or your students to create demonstrations of how a tool works, to create a simple video lesson in which you talk over a slideshow, or to create video blog entry with the webcam in your Chromebook. For many years Screencast-o-matic has been my favorite tool for creating screencast videos on Windows and Mac computers. Now it is available to use on Chromebooks too. To use Screencast-o-Matic on a Chromebook just go to this page and click "launch recorder." You can record your screen or your screen and your webcam simultaneously. You can narrate your videos by using your Chromebook's built-in microphone or by using an external mic like a Blu Snowball. The free version of Screencast-o-matic will let you record for up to 15 minutes, record as many videos as you like, and save to your Google Drive or local drive. Screencastify probably has the most name recognition of the tools in this list. Despite a set-up process that can confuse some new users, it's a solid product. The free version limits recordings to ten minutes, puts a watermark on the recording, and doesn't support direct download to MP4. On the upside, there is an option to upload directly to YouTube and to share directly to Google Classroom. The sharing to Google Classroom feature is the one that most fans of Screencastify are quick to point out to me.